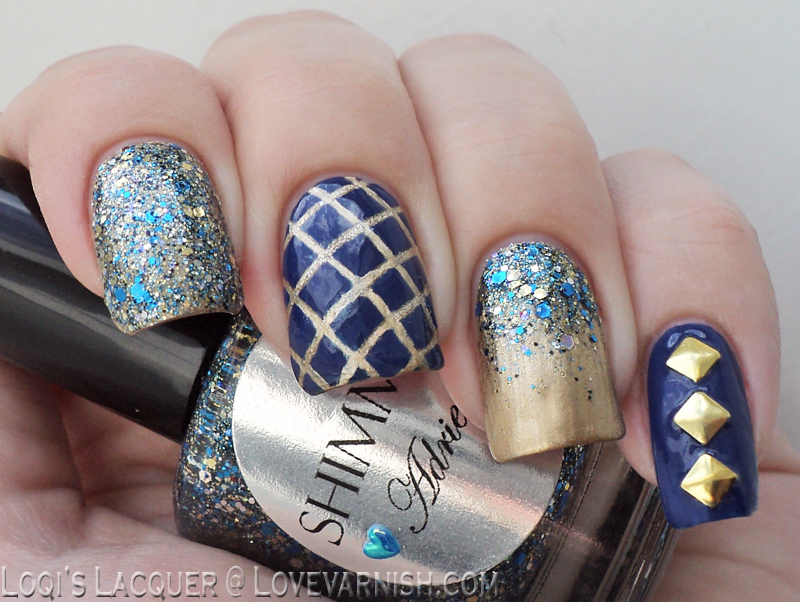 Love Varnish: Swatches & Review - Shimmer Adrienne and Cristina and some Nailart! 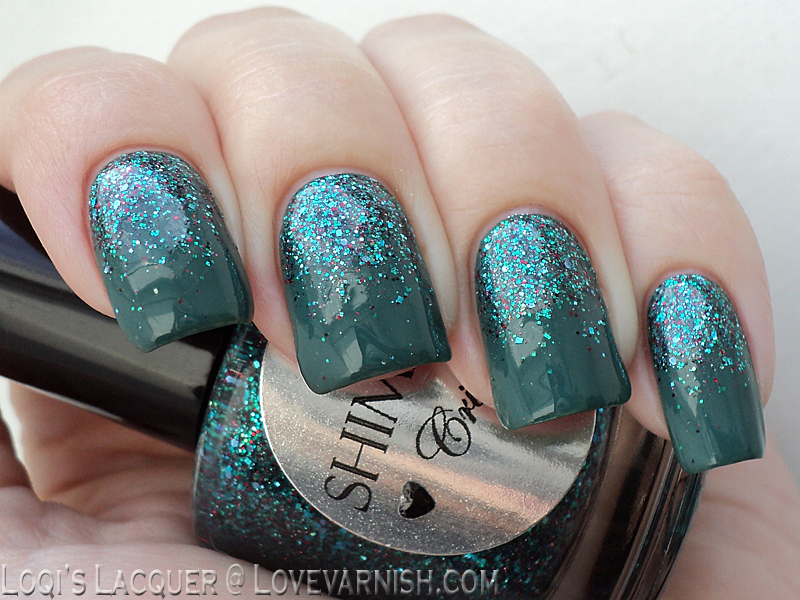 Swatches & Review - Shimmer Adrienne and Cristina and some Nailart! Hi guys! As promised I've done some nail art for you this week! I really enjoy doing nail art with glitter polishes. 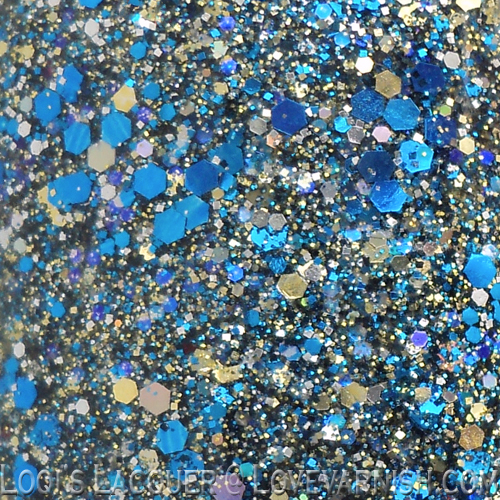 I love combining different textures and kinds of polish, so glitters are ideal for that. When I do nail art with glitter polishes I try to pick one of two colours from the glittermix and work with those to make sure all the nails still fit together even though they are totally different. For this weeks post I made a skittlette with Adrienne and a gradient with Cristina! So, do you want to see what I came up with? Adrienne is a beautiful glittermix with a clear base. It's a combination of blue, gold and silver in different sizes. This polish is best layered over another polish, so I used China glaze Passion (a gold metallic) as a coloured base. I used two coats of Adrienne for my index finger and thumb and made a gradient on my ring finger. For my middle finger I used striping tape and China glaze Manhunt (a royal blue crème polish) to make a pattern. 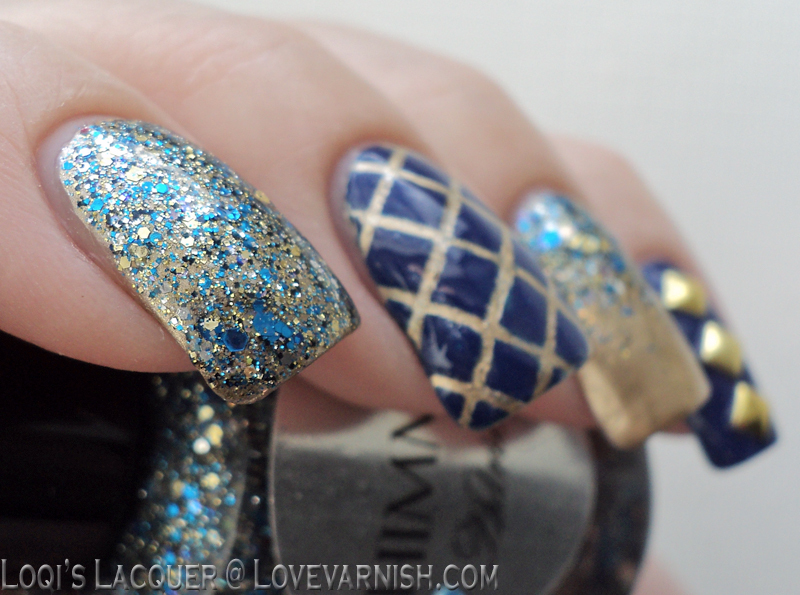 I needed 2 coats of the blue to get it opaque over the gold and sadly it made the lines kind of wonky. Lastly I put some square studs on my pinky nails and finished everything off with topcoat. I was so proud of how this turned out! 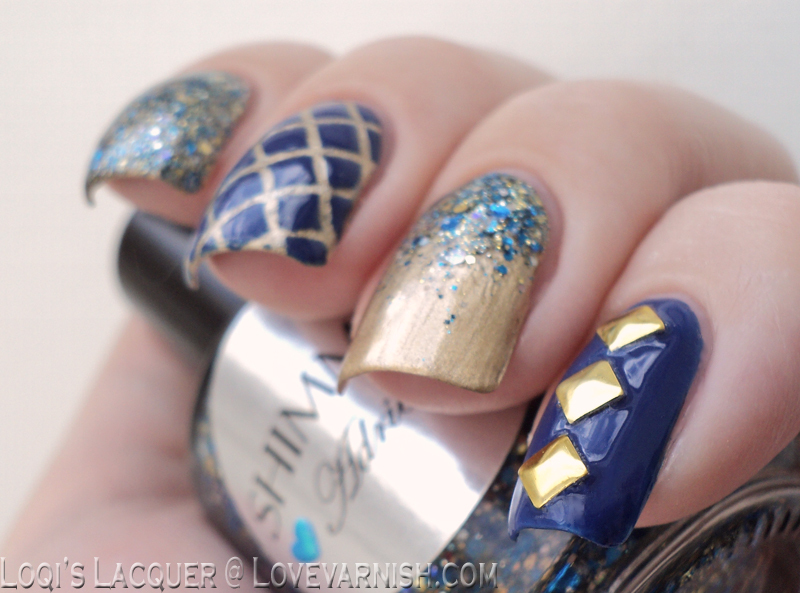 you probably know that gold is not really my colour, but combined with the blue I really did like it. For Cristina I thought I would go with a gradient. 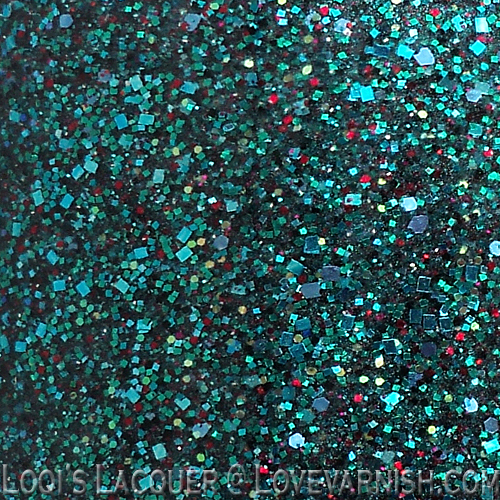 Cristina is a combination of small glitter in blue, green and red, which mixes to a green leaning teal colour. As you can see from the close-up there is square and round glitter, making this quite the intricate mix. And because all of the glitter is so small dries to a reasonably smooth finish (but I still recommend topcoat for extra smoothness and shine). It has a clear base, so I suggest layering it over another polish, I picked China glaze Exotic encounters. To make the gradient I didn't use a sponge, but instead I wiped off the brush until it was almost clean and made the gradient by hand. I find this gives less of a glittery mess on my cuticles, which can be hard to remove. I got so many compliments on this manicure! It was really popular and I really enjoyed wearing it. I especially like the little red specks, they just give this polish something extra. Oooh, I *love* the green/Cristina one! Thanks :D glad you like em!